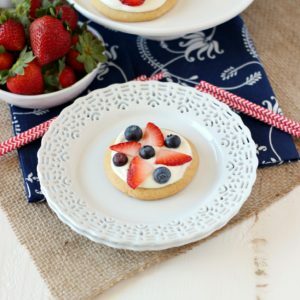 A buttery and crispy sugar cookie, loaded with cream cheese sauce, topped with juicy strawberries and blueberries. 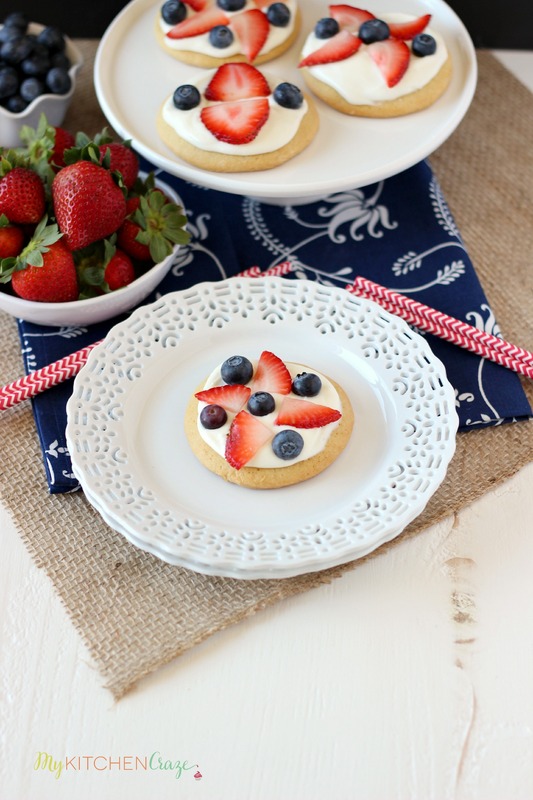 These Mini Patriotic Fruit Pizzas will be the hit of your party! Can you believe it’s almost July? Crazy right? Where does the time go? Father’s Day whizzed right on by and now we’re onto the next holiday. Seriously can time just slow down a little bit? Pretty please? Since it doesn’t seem like it’s going to slow down anytime soon, I wanted to make something for you that’s adorable and perfect for your fourth of July celebration. Do you love pizza? Of course you do. Who doesn’t? I puffy heart pizza, but I also puffy heart dessert too. Why not combine both? Wha-la! That’s where these Mini Fruit Pizzas come in. 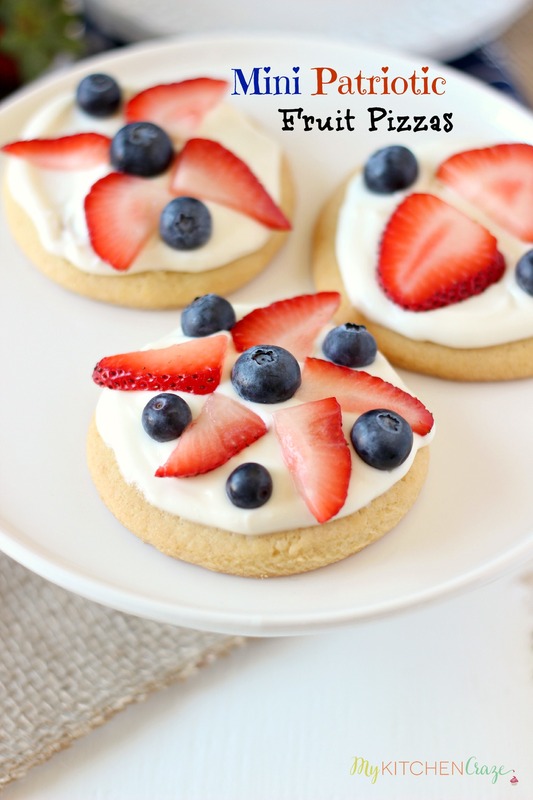 I wanted to make these pizzas for fourth of July because let’s be honest…aren’t they stinking cute? I’ve made these fruit pizzas a few times and every time I’ve made them, the family gobbles them up. Yep, they’re that delicious! I thought it would be cool to make these pizzas patriotic, so I added some strawberries and blueberries. Honestly you could add any fruit you’d like or have on hand. I’ve added kiwi, raspberries and Mandarin oranges before and these babies still taste yummy. It’s like having your very own person pan fruit pizza. Score!! 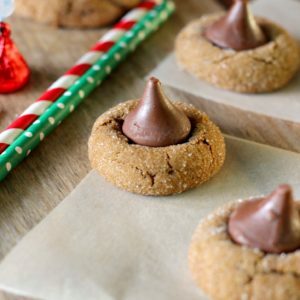 You’ll want to make the cookies before hand so they have a chance to cool completely before putting the sauce and toppings on. Also, I like my cream cheese sauce on the thicker side, so I make it while the cookies are baking, then refrigerate it until ready to assemble. This will allow it to harden and make it easier to work with. One more thing. You’ll want to keep your pizzas naked (ooh sorry) until your ready to serve and eat. One, you don’t want the fruit to get yuckie and second, the cookie will keep better this way. You’ll thank me that you kept them in all their nakedness. Hehe. Sorry had to go there. Giggle, giggle. Okay that’s the end of this post friends. Hope you love these fruit pizzas as much as we do. Remember to cherish every day since each day seems to be passing by very quickly and there is no stopping it. Cheers to another awesome holiday! 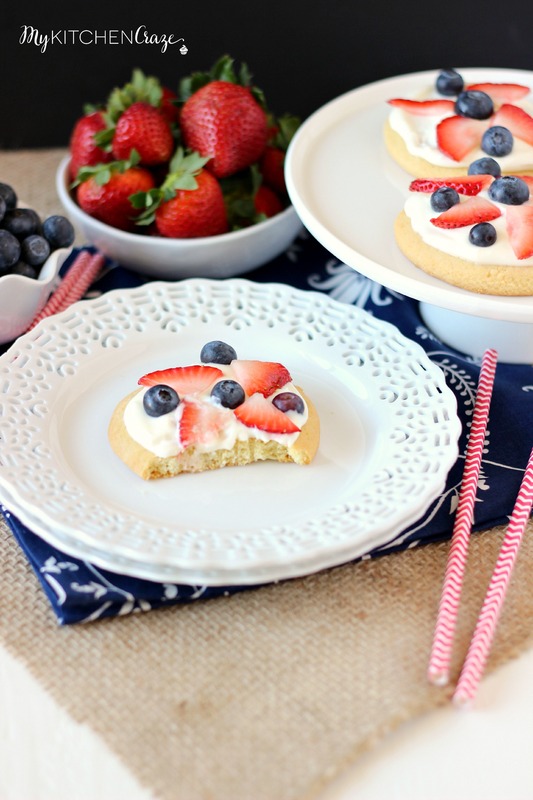 Sugar Cookie Pizza Crust: Using your stand mixer, add butter and sugar. Mix until light and fluffy. Add eggs, one at a time until fully incorporated. Add vanilla extract and mix well. In a medium bowl, add flour, baking soda, baking powder and salt. Whisk to combine. With the mixer on slow, add about half of the flour mixture, until just combined. Then add the milk and remaining flour mixture. Mix until just incorporated. Cover bowl with foil and refrigerate for one hour. Roll out the dough on to a lightly floured work surface. Roll the dough until it's about 1/4" thick, then using a circle cookie cutter or a glass cup, cut out to make mini pizzas. You'll have to re-roll out the dough a few times to get all of the pizzas. 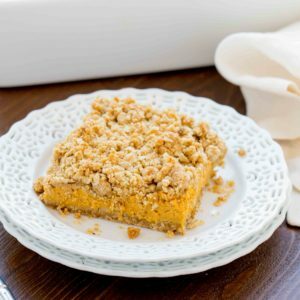 Place on a ungreased cookie sheet and bake for 13 minutes. Remove from oven and immediately transfer cookies to a wire rack to cool. Cream Cheese Sauce: While the cookies are baking or cooling, make the cream cheese frosting. Add the cream cheese and 1/2 cup powdered sugar to your stand mixer. Mix until combined. Add remaining 1/2 cup powdered sugar and mix until all combined. 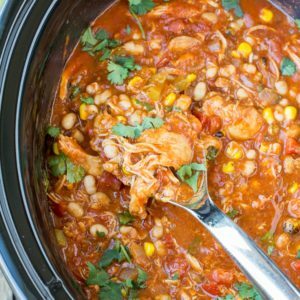 Ladle sides and bottom of bowl. With the stand mixer on slow, start adding the heavy cream. Once the cream had been added and mixture is thickening up, increase speed slightly. Add vanilla extract and mix until well combined. Make Pizzas: Take a cookie and spoon about 1 tablespoon onto the top. Spread the cream cheese out, just like you would a pizza. Then add your fruit toppings any way you'd like. Cyndi, I absolutely love these fruit pizzas! 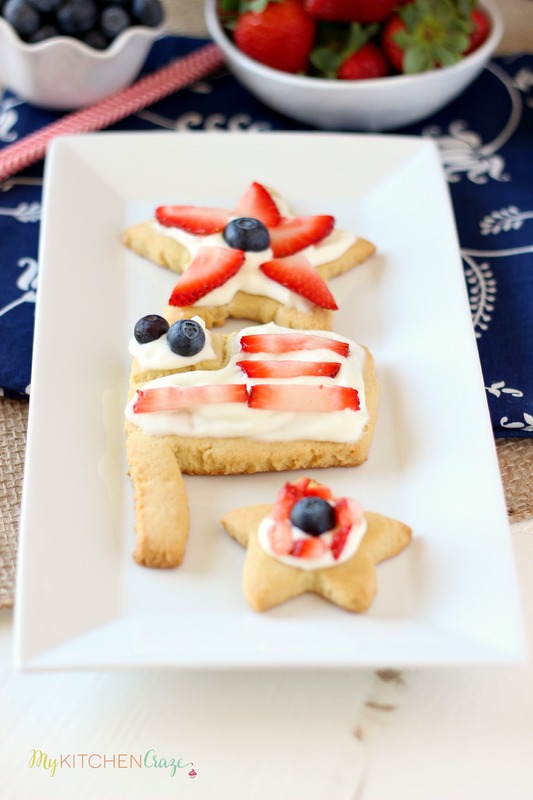 I’ve totally been slacking on patriotic desserts, so these sound just perfect. I love the sugar cookie and cream cheese combo. 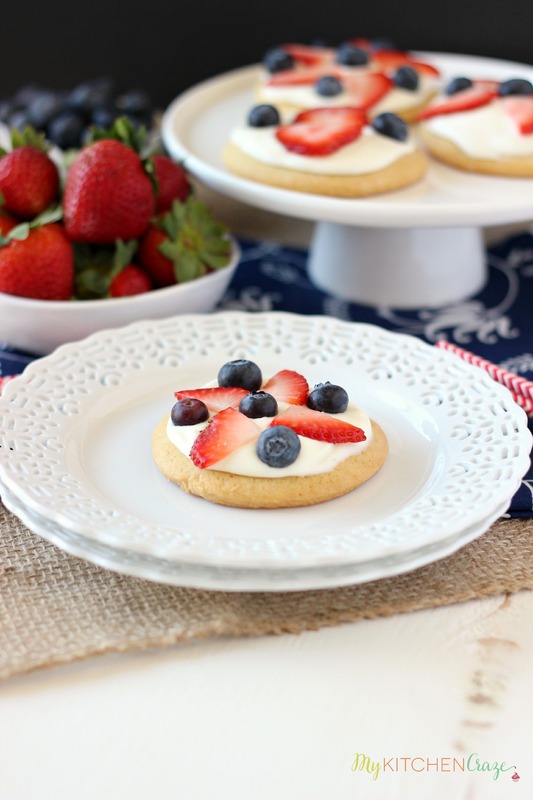 What a delicious treat for the 4th! Pinned! Well ow aren’t these just the cutest! Fruit pizza is the best! Love this festive take on it! And yes where is summer going?! Ahh I love fruit pizzas!! They’re one of my favourite summer desserts, they’re so refreshing. These look so pretty and tasty. I love the photographs too! Absolutely stunning Cyndi! It’s insane how quickly summer is zooming by already. These look adorable! So fun and festive! I can’t believe how fast this year is going! 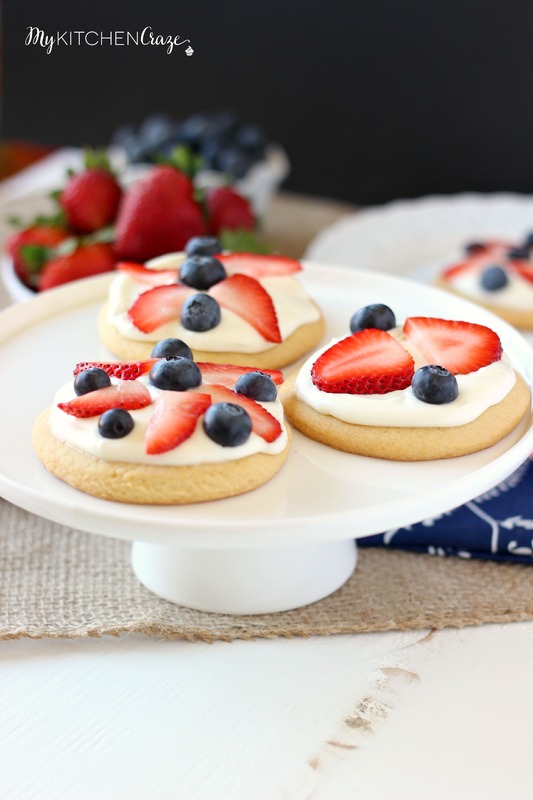 These little cookie pizzas are so fun and perfect for the upcoming holiday!!! Thank you Jocelyn! I know it needs to slow down, just a little bit!! I love how fun these are! My kids would love decorating and devouring them! I totally agree – this summer is flying right on by. Slightly scary! I LOVEEE fruit pizza! These look fantastic! 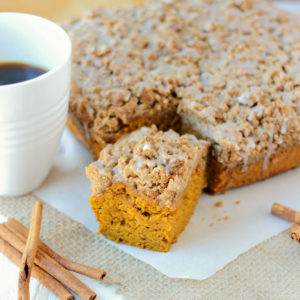 Is it bad that I would so eat one before dinner right now?? Thank you Ashley! And yes it is scary! OH sugar cookies are da best! And I completely agree…can we please slow down?! Time is going at record speed! Now that’s something healthy and delicious for kids and obviously adults too.